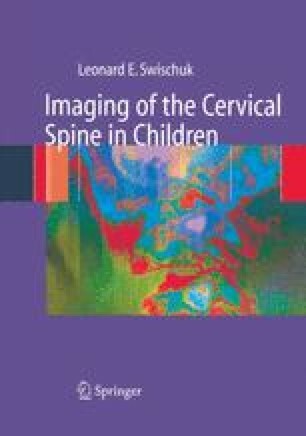 The third through seventh vertebrae of the cervical spine are similar in their development, but development is different for the first and second vertebrae. On the other hand, all the cervical vertebrae, along with the occipital portion of the skull, develop from adjoining primitive sclerotomes (1), and in terms of the upper cervical spine, it is the lower occipital and upper cervical sclerotomes that are important (Fig. 1.1). These sclerotomes undergo significant embryologic alterations so as to eventually be able to accommodate free movement of the head on the first two (atlas and axis) cervical vertebrae. In this regard, the skull first must sit firmly on the atlas. This is accomplished by way of the occipital condyles articulating with the lateral masses of C1. This union is ensured by the presence of strong ligaments between these two structures. Thereafter, the skull and C1 must be able to rotate freely on C2. This is facilitated by the dens, which serves as a pivot for this function. The resultant rotatory movement occurs primarily at the C1–C2 level, but it should be underscored that while C1 rotates, within limits, around the dens, on flexion and extension, the skull, C1, and C2 move as a unit.